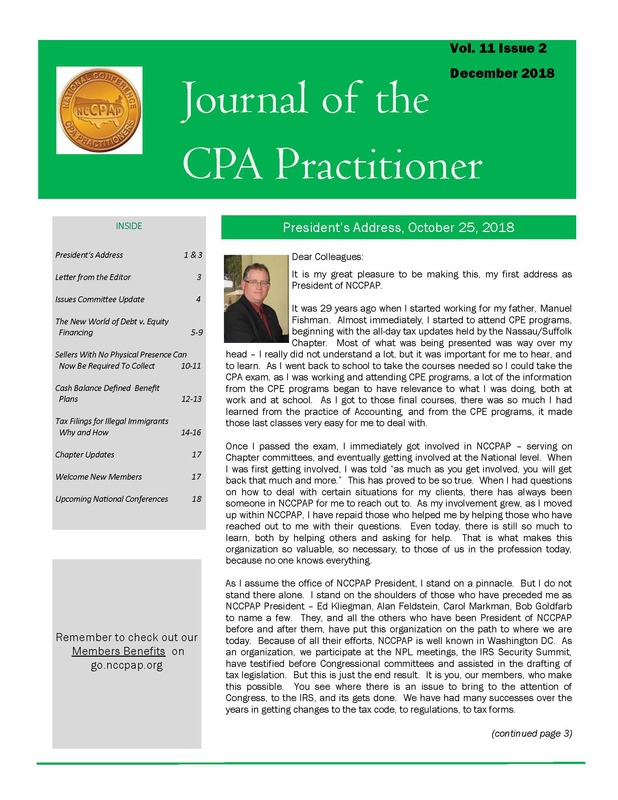 Accounting Today editor-in-chief, Daniel Hood, recently interviewed NCCPAP President, Neil H. Fishman, CPA, CFE, FCPA, CAMS. On their recorded podcast episode, Neil expounds on the following topics: Tax Cuts and Jobs Act, changes in itemized deductions and exemptions, and NCCPAP’s support of Wyden’s position regarding potential under-withheld taxes. Posted in: ncCPAp on the GO! NCCPAP Immediate Past President, Stephen Mankowski, CPA, recently attended the March 2019 IRS NPL meeting. Highlights of this month’s meeting include: IRS Tax Forums, a PTIN update, changes to EIN applications, debt collection and information for farmers and the agriculture community. Read more at the link below.